After traveling to Bolivia last fall, everyone in my family, including myself, has become totally obsessed with quinoa. My dad loves it. My brother loves it. Even my mom loves it! It’s a versatile grain that goes with a lot of different flavor profiles. I recently put together this awesome grilled vegetable and quinoa salad. Use the vegetables listed below or whatever you have on hand. I thought about putting some cheese in the salad, but left it out so my newly vegan(ish) brother could eat it. Place the chicken broth and quinoa in a medium saucepan. Bring to a boil, then cover and reduce to a simmer. Simmer for 15 minutes or until the broth has evaporated and the quinoa is cooked. Set aside. Meanwhile, prepare the vegetables. Season the asparagus, mushroom, and fava beans generously with salt and pepper and drizzle with olive oil. Place them directly on a grill that has medium fire or is set to medium high heat. Cook the asparagus and fava bean pods until charred and tender, turning once, about 3-5 minutes. Cook the mushroom until soft and fragrant, flipping once, about 6-8 minutes. Set aside to cool a little. When the vegetables are cool enough to handle, chop the asparagus and fava beans into 1/2-inch pieces. Dice the mushroom. 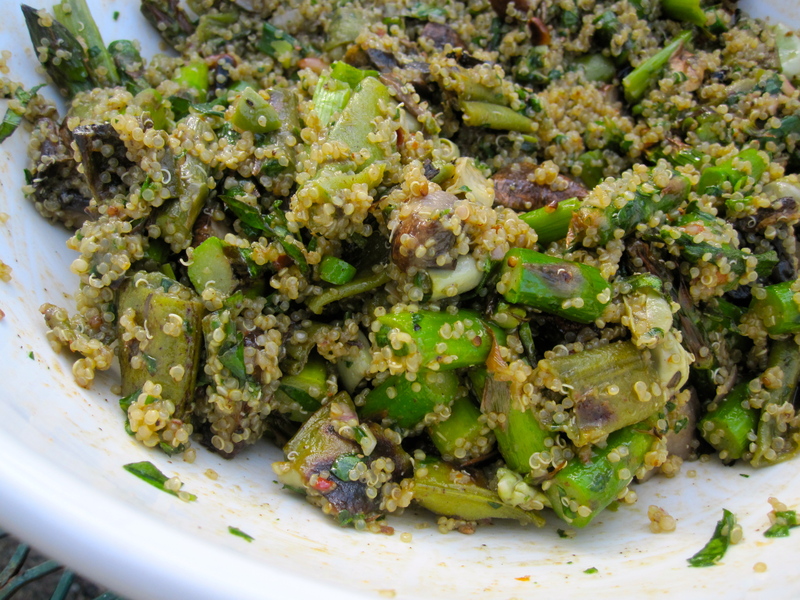 In a large bowl, combine the quinoa with the grilled asparagus, fava beans, and mushrooms. Add the chopped spinach, herbs, and pine nuts. Season generously with salt and pepper. In a small jar with a lid, combine the sun-dried tomato pesto with the minced garlic, Dijon mustard, and balsamic vinegar. Add 1/4 cup olive oil and salt and black pepper. Put the lid on and shake well to emulsify. Taste and adjust to your liking, adding more oil if necessary. Pour the dressing over the quinoa and vegetables and toss well to combine. Serve immediately or refrigerate until ready to enjoy. The salad will keep in the fridge for a couple of days.